During ΕΛΠΙΣ, melodies taken from .59 and pandora can be heard. Some melodies are also similar to No.13. ΕΛΠΙΣ is the 2nd style × 10th style boss song of LEGEND CROSS in beatmania IIDX 20 tricoro. When ΕΛΠΙΣ is played as a boss stage in LEGEND CROSS, the arcade LED ticker displays "RED BOSS 2" or "RED BOSS 7", depending if you're playing on Old Style x Newer Style or viceversa. When played outside of LEGEND CROSS, the arcade LED ticker for ΕΛΠΙΣ displays "ELPIS". From December 19th, 2013 onwards, ΕΛΠΙΣ is playable by default. In Greek mythology, Elpis was the personification and spirit of hope. She was depicted as a young woman, usually carrying flowers or a cornucopia in her hands. In Hesiod's Works and Days, Elpis was the last item in Pandora's box. Coincidentally, beatmania IIDX 10th style's pandora is one of the songs which is sampled in ΕΛΠΙΣ. 59 Elpis is the name of a very large main belt asteroid. Romanticism is an artistic movement that began in the late 1700s and rose to prominence in the early-to-mid 1800s. Much of the artistic work that falls under romanticism places a great emphasis on "intense emotion, spirituality, nature, and the past". A variation, in music terminology, is the act of repeating a phrase with alterations to the original form, be it the melody, rhythm, harmony, or other aspects. The boss in ΕΛΠΙΣ's overlays appears as a blonde, woman angel who wields a golden sword. Her name is elpis‡煌‡ and her element is Gold. The overlays of .59 also depict an angel. When you miss a note, the boss will rush toward the screen. The boss has a second design which is shown when you fail to Normal Clear ΕΛΠΙΣ. According to dj TAKA's song comments, he chose 2nd and 10th style for ΕΛΠΙΣ's melodies in reference to how beatmania IIDX 2nd style was his first sound directing role in IIDX, and how 10th style was a turning point in the series for him. 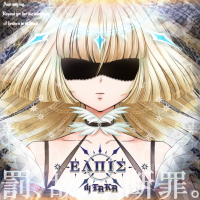 In the U.S./EU iTunes version of the beatmania IIDX 20 tricoro ORIGINAL SOUNDTRACK Vol.1 album, ΕΛΠΙΣ is simply known as Elpis. ΕΛΠΙΣ is a song part of the POLICY BREAK event. For more information on the dates it can be unlocked in the SOUND VOLTEX series, please see the event page. From June 15th, 2018 in SOUND VOLTEX IV HEAVENLY HAVEN, it can be purchased with BLOCKs instead. ΕΛΠΙΣ's jackets in SOUND VOLTEX changes the look of elpis‡煌‡'s eyes depending on the difficulty; the NOVICE jacket has her normal blue eyes, the ADVANCED jacket has the red eyes from her corrupted design, Elpis der Weltraum, from Shooting Fireball, and the EXHAUST jacket has her shaded eyes from clearing ΕΛΠΙΣ in IIDX. Additionally, the EXHAUST jacket has the line "罰、故に断罪。" from the beginning of Shooting Fireball at the bottom. 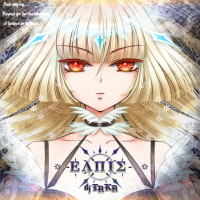 ΕΛΠΙΣ is available in beatmania IIDX INFINITAS as part of the beatmania IIDX INFINITAS 楽曲パック vol.4. This page was last edited on 31 January 2019, at 00:25.